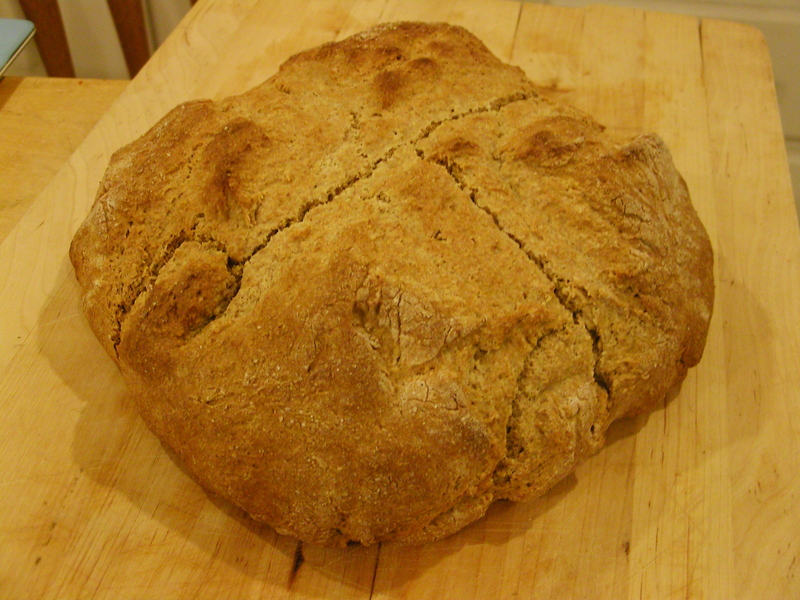 This past week at work, we’ve been making a lot of soda bread and Irish brown bread in anticipation of St. Patrick’s Day. Tonight, I decided to make some of the latter at home. 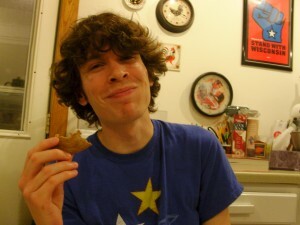 So far in this blog, the “or not” side of “bready or not” has been heavily represented; now, I finally bring you something bready. The great thing about soda breads is that because they use baking soda for leavening, they’re instant gratification. Well, at least compared to yeast breads. (Can you have degrees of instancy? Or is something either instant or not? Anyhow…) No waiting for anything to rise. 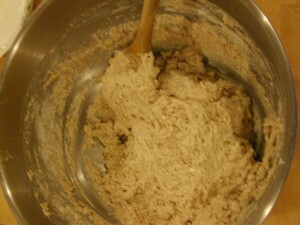 The recipe I used is not the one we use at work, but it’s fairly similar. Whole wheat flour plays a big role, which endears it to me. I’m a big fan of whole grains. Good for you; good flavors. Not that I don’t also love a delicious baguette or challah, though. 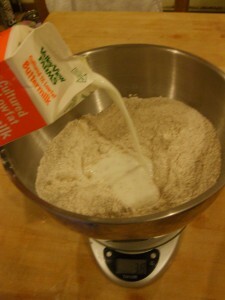 The recipe lists quantities for some ingredients by weight as well as by volume. If you have a kitchen scale, this makes things way easier! 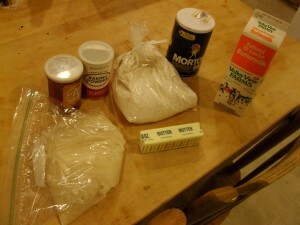 I didn’t need any measuring cups, and only needed measuring spoons for the baking powder, baking soda, and salt. This picture is actually from before stirring. This dough came out reallllly wet. If your dough comes out as wet as mine did, I recommend using a bowl scraper. Or whatever you can find to get that gooey mess out of the bowl. 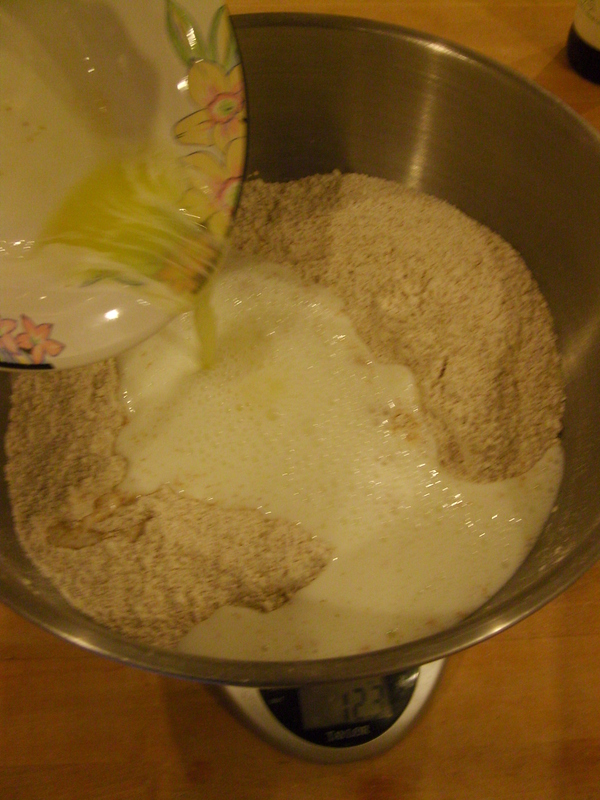 Put it on a floured board. 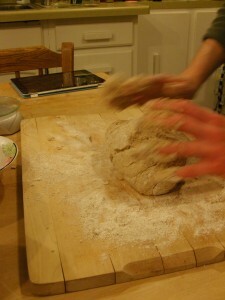 Knead briefly…if it’s un-kneadable, as it was for me, throw some more flour in there. A *lot* of extra flour did the trick for me. Photo credit for awesome action shot goes to Tyler. 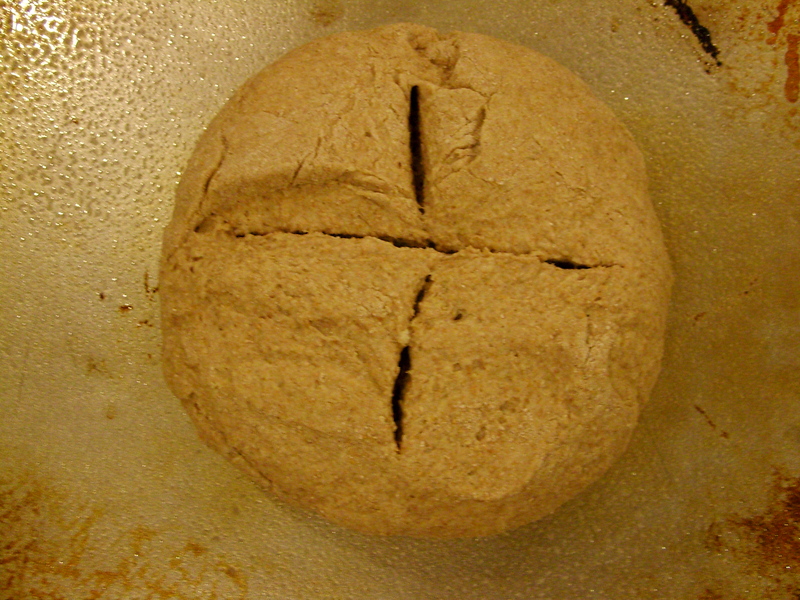 Shape into a round loaf and place on a lightly greased cookie sheet. 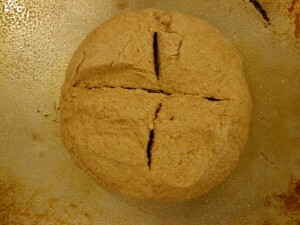 Cut a deep cross into the loaf. 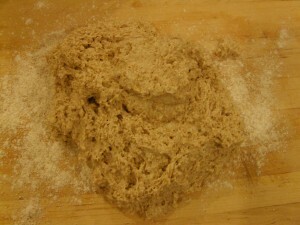 Bake at 400°F for about 40 minutes. You can test for done-ness with a knife in the middle of the loaf. It should come out clean. I turned the temp up to about 410° on my oven, cause it runs cold. Serve to people whose undying admiration and gratitude you desire. 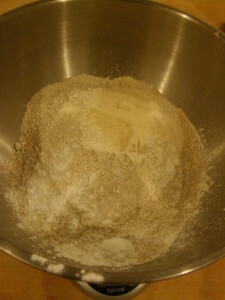 In a large bowl, stir together the flour, sugar, salt, baking soda and baking powder. Make a well in the dry ingredients and pour in the buttermilk and the oil or butter. Stir together until blended—some lumps will remain. 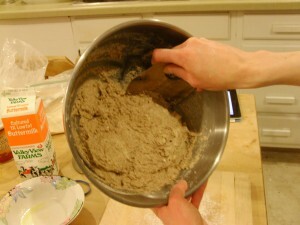 Turn the dough out onto a floured board and knead about 10 times, or until it all holds together. 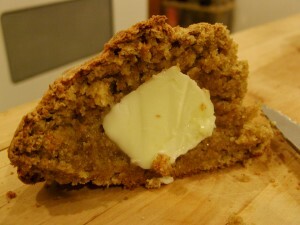 Form it into a large ball and place it on a lightly greased baking sheet. Cut a deep cross in the top. Bake the bread in a preheated 400°F oven for approximately 40 minutes, or until it tests done (a cake tester inserted into the center will come out clean.) 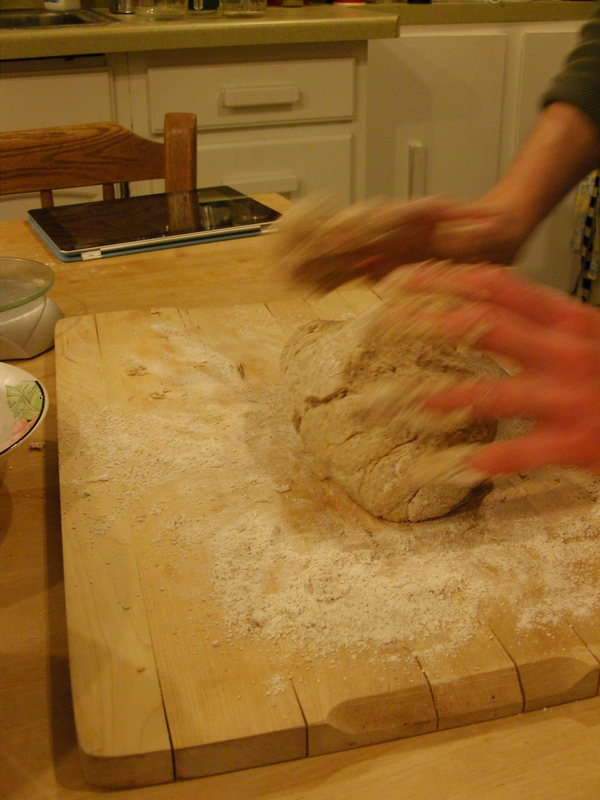 Yield: 1 large round loaf, 10 to 12 inches in diameter.